When I sat down at my craft desk today I didn’t have much in mind as far as a project or design so I just starting playing around. Inside one of my ink pad bins I found several Opalite Ink pads that I purchased awhile ago but never used much. I used these ink pads along with some long forgotten embossing powders to test and try different ways of using them together. This card was made by blending (using a color box blending tool) different Opalite ink colors for various backgrounds. First I applied Opalite to a piece of black card stock on which I stamped and embossed a flower to create my focal point. Next, I used the Opalite on Inchie Art one inch squares and then stamped a birthday wish. 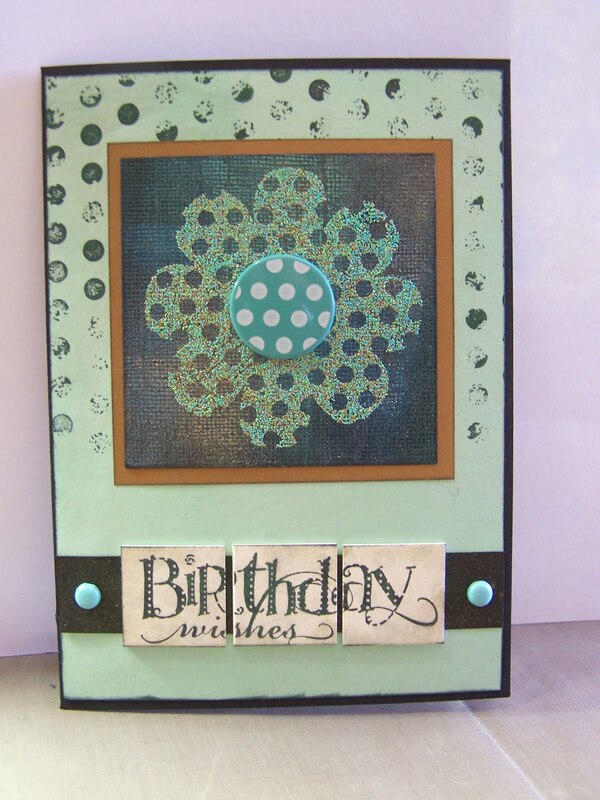 The card face was also treated with the Opalite ink prior to adding a stamped polka dot image for a background. All the pieces were assembled on the card. Lastly, I embellished with a few brads and mounted the entire card face onto a black 9 x 6 1/4 inch card.